A few week’s ago I was visiting a farmers’ market with a friend who purchased several bags of spring bulbs from a stall. When she asked me if I was buying any I told her my soil was too sandy. We walked off; then I felt a tap on my shoulder. “I couldn’t help overhearing you”, said the stallholder. “You sound like you know a bit about gardening, so please take this, with my blessing”. She passed to me a creamy coloured corm, about the size of a small onion. I guessed it was Colchicum and carefully took it home … to my sandy and salty patch by the sea. Before I got the chance to plant it out it began to shrivel and darken. I was appalled, thinking I had betrayed my kind donor. I watched, fascinated, as two slender buds appeared at the base, then extended and unfurled to reveal delicate white and mottled pale lilac petals. I desired to know more about this beautiful genus. Colchicum is named for Colchis, the ancient Greek term for the region at the eastern end of the Black Sea and south of the Caucasus mountains. The region hosts some 6,400 plant species, and 80% of the plants growing on the Colchic limestone scree are found nowhere else in the world. There are 17 endemic genera of plants, nine of which are associated with high mountain ecosystems, but the vegetation types are very diverse. Colchicum is not a true crocus genus, although the two are often confused. Colchicum belongs to its own family, Colchicaceae. Colchicum flower without leaves, which don’t appear until spring and are broad and can flop over and conceal smaller flowering plants. Conversely, crocuses have thin, grassy foliage and flower in the spring. Common names for Colchicum include Naked Ladies, Autumn Crocus, Meadow Saffron, Naked Boy and Son-before-the-Father; the latter three are based on their cycle of flowers appearing (generally) in the autumn with no leaves, with the leaves and seeds appearing in the spring, then becoming dormant again in the summer. There are about 45 species in the genus. 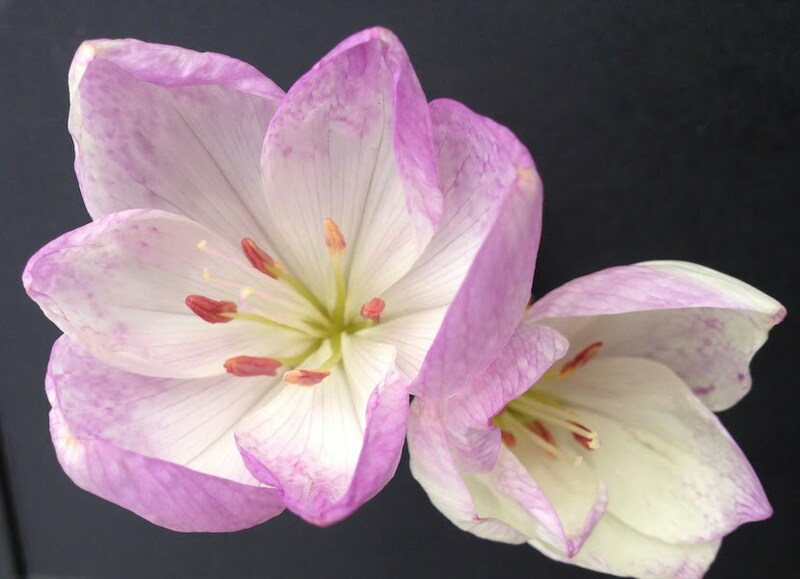 In addition, the Pacific Bulb Society and Odyssey Bulbs each show at least 12 named Colchicum hybrids and cultivars; perhaps the best known of which are Colchicum ‘Waterlily’ (double, ruffled, rosy-lilac flowers) and the white flowering cultivar Colchicum autumnale ‘Album’. 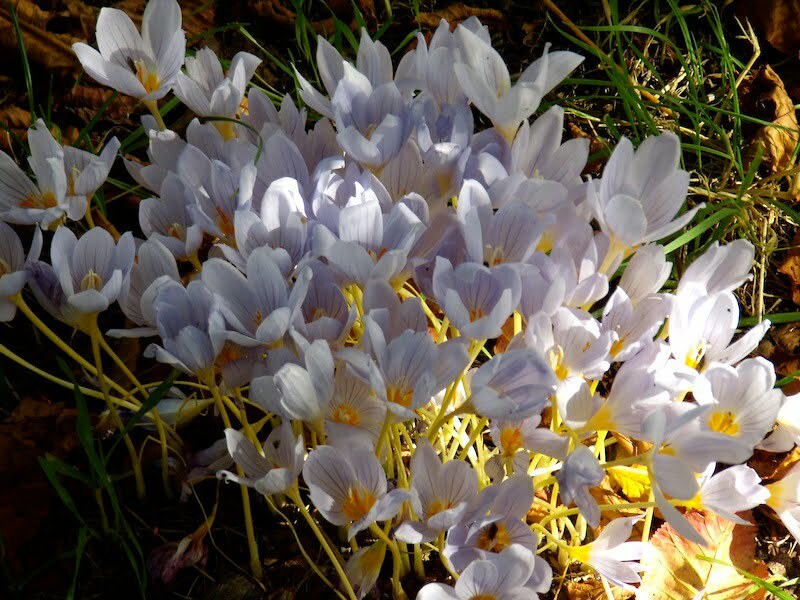 I last saw naturalised clumps of Colchicum pushing their golden-stemmed and purple-striped heads through fallen oak leaves in Kew Gardens, and under late flowering perennials at the Chelsea Physic Garden, in London. No doubt they were grown at the latter due to their pharmacological history. Unlike their doppelganger the Saffron Crocus (Crocus sativus, family Iridaceae) all parts of the Colchicum plant are poisonous; however Colchicum autumnale is a source of alkaloid colchicine, a drug used in cancer treatment. Although colchicine was originally used to treat rheumatic complaints, particularly gout, it is also used to treat auto-inflammatory or immune-mediated conditions such as familial Mediterranean fever and Behçet’s disease. Despite ongoing concerns about its toxicity and well-documented cases of death from self-medication, suicide or it being mistaken for ‘Wild Garlic’ (Allium ursinum) it is still used as chemotherapy. The Poison Garden website notes colchicine is “used medicinally because it destroys white blood cells … but it has such a low therapeutic index that overdose can easily occur and, like all medicines, errors in preparation can add to the problem. In the USA, the Federal Drug Administration placed controls on its sale after it was implicated in 23 deaths, three of which occurred after a batch eight times the proper dose was prepared by mistake”. Due to its propensity to affect animal cell meiosis, colchicine is also employed in commercial plant breeding as it results in plants that are hardier, larger and faster growing (in reality, plants that are genetically mutated). In species such as watermelons, colchicine-induced triploidy (a chromosomal abnormality in which the nucleus has three sets of chromosomes) has been used to create ‘seedless’ fruit. 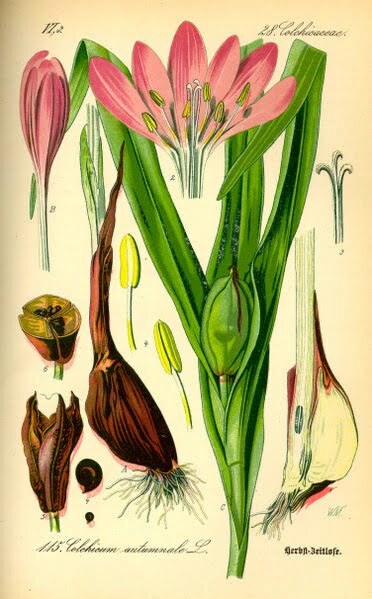 The 16th century author, herbalist and botanist, John Gerard, notes Colchicum could be prepared with egg white, breadcrumbs and barley meal, for example, as a poultice for gout. Even he was aware over-ingestion was detrimental to the stomach and recommended the drinking of plenty of cow’s milk to prevent adverse symptoms or death. Gerard’s heavily illustrated Herball, or Generall Historie of Plantes (1597) was largely amended in the 17th century, but the references to Colchicum, it is presumed, remained intact, as the plant’s affects were so well known. The medicinal value of Colchicum was documented in the first century A.D.; however, the use of the alkaloid colchicine for the treatment of gout dates back to 1810. 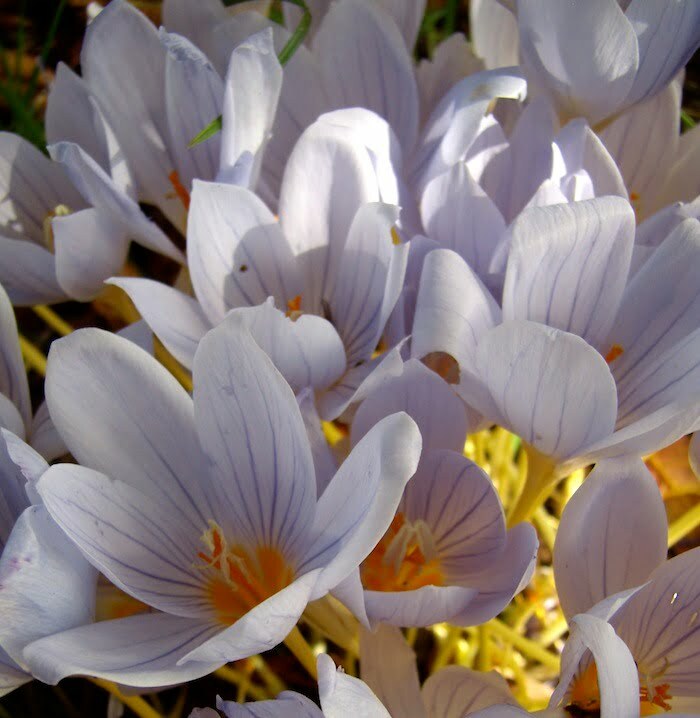 In their native habitat Colchicum grow in sub-alpine meadows or on stony hillsides. While the genus is also native to Europe, North Africa, West and Central Asia, Northern India and Western China, the Caucasus is the region in which one best imagines the plants – tucked into the scree, pushing their pale heads through the gravel in the autumn (hence Colchicum autumnale). Accordingly, plant autumn-flowering Colchicum in moderately fertile, relatively dry soil in sun or light shade. Dwarf and spring-blooming species prefer full sun and to stay dryish while dormant. The genus suits rockeries, pots and herbaceous borders; plants can be propagated from seed and often multiply naturally from offsets, given the right conditions. 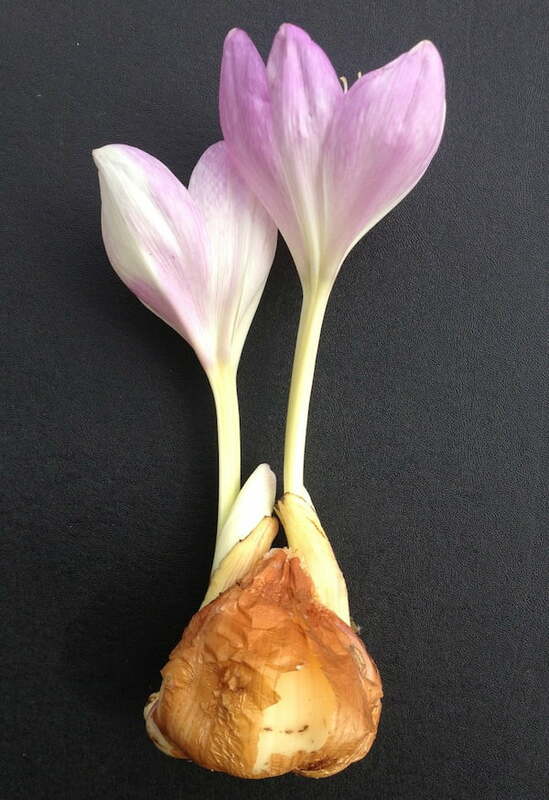 Due to the purple tessellations on the petals I tentatively identified my specimen as Colchicum bivonae, a species highly regarded for its colouration, but known to be slow to increase in colder regions. As I write, a second set of buds is emerging from the shrinking corm and I am thinking long and hard about the perfect spot for planting. I am remembering the clump at Kew and how pretty they looked in the low afternoon light; pretty, but with a poisonous secret. You have won me. I am on sandy soils on Sydney Northern Beaches – where can I purchase Colchicum bulbs? on-line ? or will it be too warm there ? I did a quick search and found at least three suppliers – Garden Express, Vogelvry and Lambley. I have had great success with stock from the latter. 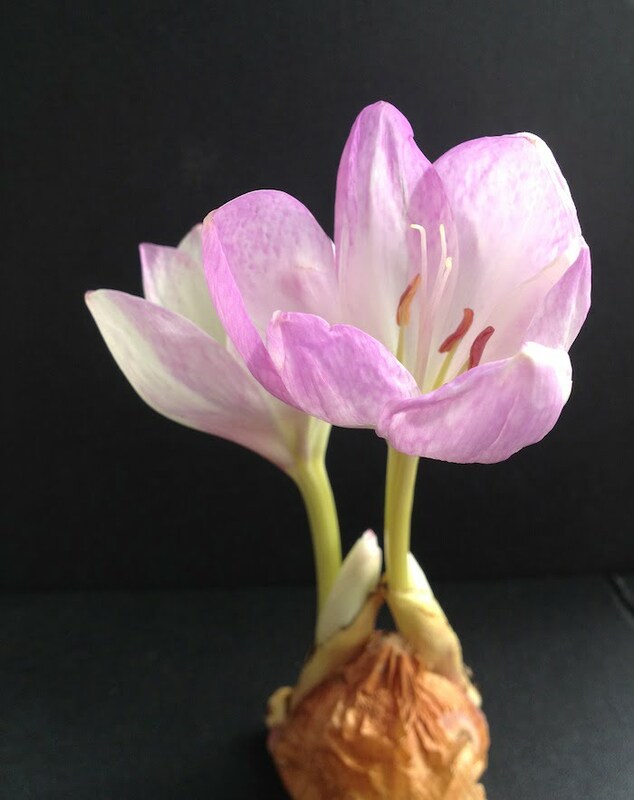 In terms of growing Colchicum, try to replicate their native growing conditions – a climate with distinct seasons – fertile, well-drained soil (but don’t let them dry out completely) in a position in either full sun or half-sun. A great article, Catriona. Colchicums are a feature in many autumn gardens in Southern Australia, especially in the cooler “hill station” gardens on Mt Macedon and Mt Dandenong but also around Melbourne and even in parts of Central Victoria. I feel I should point out however that the last two pics aren’t of Colchicum but one of the autumn flowering (true) Crocus species, possibly C. pulchellus. Yes, there are autumn flowering Crocus as well – quite a lot actually and they do well in many parts of Australia, especially the Blue Mountains, the Dandenongs and many parts of Tasmannia. Thank you for correctly identifying the true crocus in the latter pictures – I must say I was thrown by the Autumn flowering time. Good to know they grow here in Tasmania too. Thanks for the interesting and informative article, Catriona. I have very similar looking blooms pop up after rain in the lawns and under trees here in SE Queensland, am told the pale pink flowers are storm lillies. They don’t have the beautiful markings of the colchicum, though. Our clay soil probably wouldn’t support? What you describe is a member of the Zephyranthes genus – known commonly as Pink Storm lily, or Pink Autumn Crocus. As SE Queensland does not have a Mediterranean climate (in fact, it has the opposite) I suspect that factor, and the prevalence of clay, would not suit growing Colchicum in the ground, but you could try growing them in pots.